Here you'll find just a handful of what we think are the best ukuleles available for beginners to the ukulele who need an instrument that's reasonably priced, and easy on the ears too. 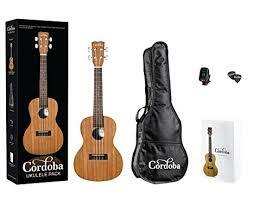 Another beginner option from one of our favorite brands here at Lord Uke is the Cordoba UP100 series. A complete ukulele package containing an all mahogany Cordoba concert ukulele, travel bag, digital clip-on chromatic tuner with color display, picks, and a ukulele chord and lesson book including lessons from Alfred Music Publishing. Comes with Aquila Nylgut strings., in our opinion, one of the best value ukuleles for $229 this includes shipping. Excellent value for money ukulele that sounds great $229. Made by the classical guitar company Córdoba. The Cordoba 20TM is a tenor size ukulele that features a solid mahogany top and mahogany back and sides. The natural wood pattern rosette and satin finish make this a truly beautiful instrument. This is great for both beginners or someone looking to step up from an entry level uke to a solid top tenor.. Beyond the sound is the sensible design and tasteful appointments this tenor uke has. It looks perfect for what many like in an ukulele. A clean tone with nice sustain, and after our custom fretwork this ukulele is an Amazing value. The 20TM comes with a Triple gig bag included, but gig bags are available for $369.00 shipped FREE in Australia. This Aqua ukulele is for players who want a ukulele that stands out compared to your average beginner ukulele. The features of the CK3 include a Koa timber top, back and sides, with a slotted headstock and linen gig bag. The CK3 stands up to ukes well above its price point, so for $289 you really do get a lot for your money.